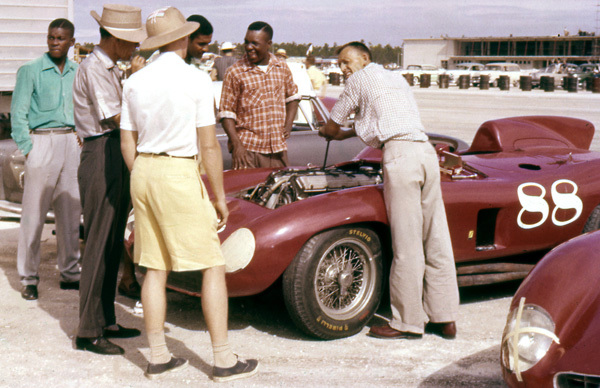 Edgar Team chief mechanic Joe Landaker wrenches on Ferrari 857S at Windsor Field, Nassau, Bahamas, December 1956. “The Big Show” (Ferraris galore racing at Bahamas Speed Weeks, in December 1956), Words by William Edgar, Color Photos by Edgar Motorsport Archive and B&W by Tom Burnside, is a 6-page story in the December 2013 issue of Forza magazine. Driving the John Edgar-entered Ferrari 410 Sport, Carroll Shelby won the Governor’s Trophy race in the dark, 3 seconds in front of Alfonso de Portago in a Ferrari 860 Monza. Stirling Moss won the main Nassau Trophy race in a borrowed Maserati 300S. The local bars were jammed. Parties went on to dawn. Carroll Shelby goes Hawaiian with a Ukulele on Oahu, Territory of Hawaii, April 1957, as friend Ralph Eisman forgoes comment. 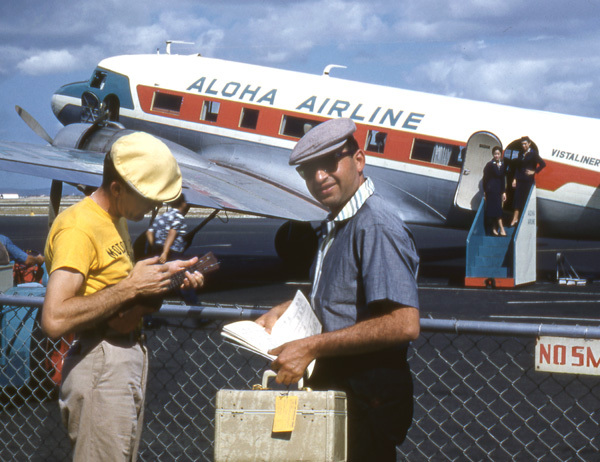 “Hawaii Called” (The inaugural Hawaiian International Sports Car Speed Week, at Dillingham Field, Oahu, Territory of Hawaii, in April 1957), Words by William Edgar, Photos by Edgar Motorsport Archive and Phil Hill Collection, is a 4-page story in the September/October 2013 issue of Vintage Motorsport magazine. Pete Woods won the main in a Jaguar D-Type. Phil Hill was fastest in the Mauka Straight speed trials at 165.12 mph driving the John Edgar-entered Ferrari 410 Sport. It was rum and luau time all week, until saddened by the fiery Sunday race crash resulting in the death of Leo Brero, Sr.